We touched down Hong Kong at night after a 3.5 hour flight. At the airport, we get ourselves prepared for the following day’s travel by getting Octopus cards for everyone. There are three types of cards: child (ages 3-11 – $70), adult ($150) and elder ($70). You can get it at any MTR train counters at the airport. It is a stored value card. You can use it for many things: transport, retail shops, parking, etc. This is a must-have even for Hong Kong people. You are advisable to get one when you are in Hong Kong. We took an urban taxi to Tsim Sha Tsui. It was more or less a 30-minute drive. And the fare was $235.50 – all in. Please bear in mind they charge for toll (Tsing Ma Bridge) and luggage. 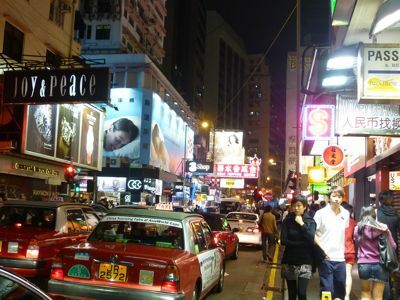 Taxis in Hong Kong are safe and reliable and you don’t need to negotiate the price as they use meter for the billing. Receipt will be given upon request and you are advised to do that. By the time we reached our hotel it was already 11pm. As expected, due to space limitations, hotels (and all buildings in Hong Kong for that matter) are smaller than what we are used to. This is expected of our hotel and is reflected even at the lobby. Frankly, I did not placed too much hope in the hotel but what I saw in Hotel Benito exceeded my expectations. One of the reasons my wife chose this hotel was (besides the price) it is a 100% non-smoking hotel. When we opened the door to our room, I was happy to see that it was clean and free from unpleasant odor. Basic amenities are available: complimentary water, towels, hot shower, hair dryer, slippers, free wired Internet access, free local calls, TV, safe box. I have nothing more to ask for. The only complaint throughout my four-night stay at Hotel Benito was we were given overly-used towels once. The rest was fine. TIP: My wife found a very useful website that compares and summarizes hotel rates by searching a few travel sites. The website is wego.com. From this website, we found out that Booking.com offered the best rate for the hotel. Another best thing about it was we were not required to pay upfront and we could cancel the booking without penalty if done within the required period. Perfect. My wife’s friend gave her two local Hong Kong SIM cards so that we could equip them on our mobile phones while we were in Hong Kong. After trying to make the phone work a few times, only then did we find out that the pre-paid SIM card had no value. It worked fine after we topped up the value. It is convenient to get a local SIM card here. Simply go to any 7-Elevem outlet. There are aplenty here. Why roam your phone while you can enjoy local phone rates.